My name is Jessica L'Heureux, and I enjoy creating knitwear patterns, and tend to specialize in socks, shawls and hats. I used to work as a knitting instructor and I taught many of my patterns. My patterns are designed with the beginner in mind. I endeavor to create patterns that expand on the basics while being enjoyable to knit. In today's world, knitting is ultimately a form of entertainment with productive results. I try to inject "fun" into both my classes and patterns. When I'm not knitting, I'm dyeing. I love to create color. I have a broad selection of bases that I work with and offer custom orders in addition to my ready to purchase selections. From time to time I offer special clubs and kits. 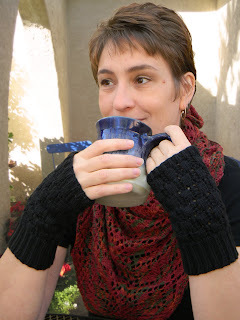 In addition to knitting and dyeing, I love to ride my motorcycle, read, and cook. (I’m the type that lives to eat rather than eats to live.) I've had many, many jobs in my life and done a lot of amazing things. I've worked as a ski instructor, town clerk, restaurant chef, waitress, bus-girl, dishwasher, hostess, bartender, corporate mascot, concession stand attendant, appointment setter, fabric cutter, cashier, furniture delivery, concert security, grocery stock clerk, psychic reader, website designer, office manager, event coordinator, cleaning staff for FBI and DEA offices, cookware salesperson, ticket salesperson, telemarketing, property manager, actress, production runner for Stars on Ice, several various administrative positions, conducted phone surveys regarding digital oscilloscopes, and even owned a couple companies. I love to sing, but can’t carry a tune in a lead safe. The idea of skydiving makes me ill, and I have an irrational fear of escalators. I’m originally from Maine, so I know COLD, and I know, wool matters. Sadly I also know ugly knit hats. I’ve gone cold just so I didn’t have to wear ugly hats in public. I strive to create knitwear designs people actually want to wear, items that flatter while warming. I live with my husband, John, and our three dogs in sunny New Mexico. I'm an active participant on Ravelry, Instagram and Pinterest. I also enjoy creating knitting and dyeing related podcasts.